IH would like to present a tool that is widely used in order to sustain our own research and writing efforts. 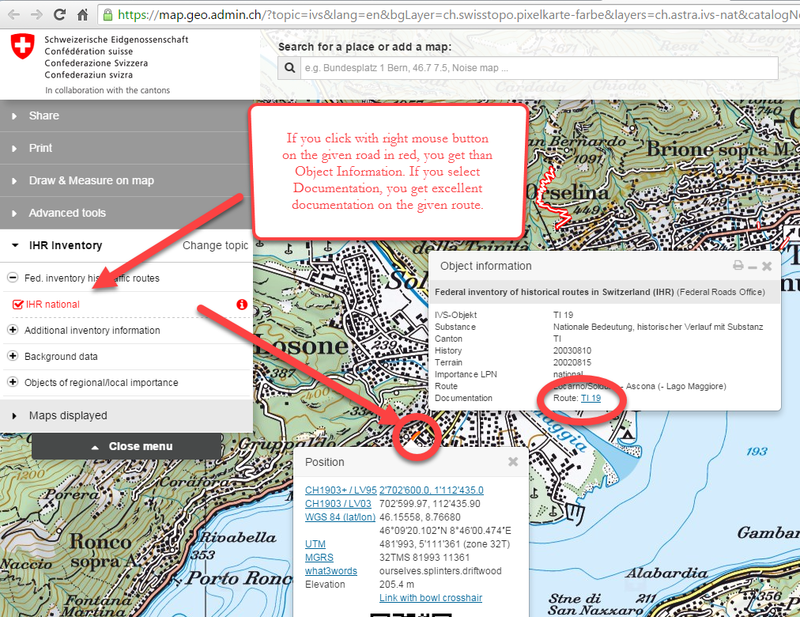 This tool is a web platform: www.geo.admin.ch. 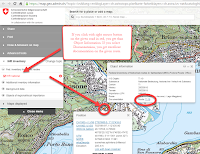 This website is the official GIS information platform of the Swiss Confederation, and it is one of the most awarded and visited websites in Switzerland. Fully accessible, it allows the user to search immediately for a large amount of specific charts, for example, in 2018 there are at least 480 different maps, related to Switzerland. In addition, there are historical maps, aerial photographs, field names, noise maps, travel times, waterdams, tick-epidemic areas, and much more content is still available online. Aerial photographs maps: mostly b/w pictures dating from the Second World War and even before. For border regions, such as the Insubrica region, the pictures are also available for the Italian territory (or for all bordering countries and regions). The number next to the pin is the precise year in which the picture was taken. Just click on the year and a pop-up window will highlight the given picture. You then click again on the picture, and with a right mouse click you can save the content on your hard-disk. This particular service can also be combined with other maps, such as the "Journey through time maps". Here a given picture link for Ascona pictures taken in 1953. 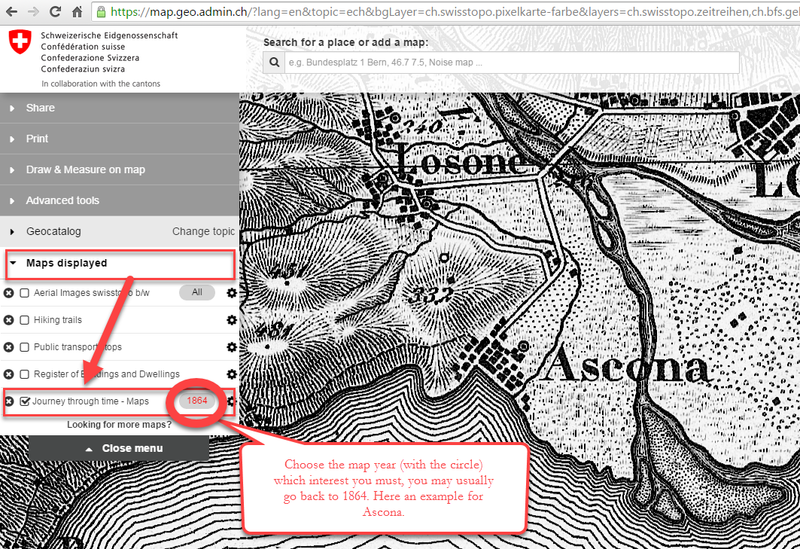 Wayback maps: With geo.admin.ch you can travel back in time, till 1864. The service is also available for border regions. You just have to change the year, and you can swap automatically the chart. This is a very good instrument to realize how a given spot has changed in times. 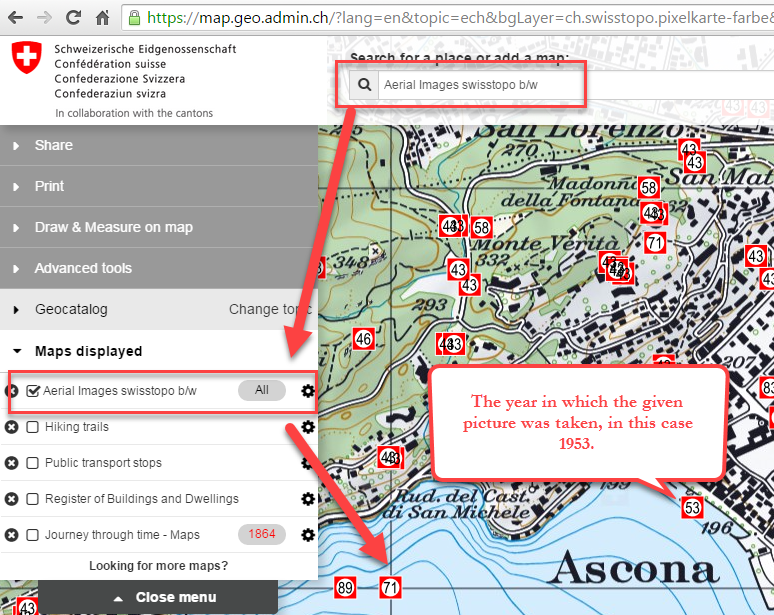 We used this tool for our articles on Ascona dynamite factory and Polish internees soldiers in Losone. We use this service with a great pleasure. For example, it could be a very smart gift for friends who have just bought a new house, combined with the aerial picture mentioned above, showing them how the area changed in time. It is also amazing what you can discover that has been long forgotten. Swiss Federal Inventory of Historical traffic routes: This is probably the most hidden gem at map.geo.admin.ch showing what the Swiss Federal Roads Office (FEDRO) did to manage the inventory of historical traffic routes in Switzerland. There are specific requisites in order to have a road to be admitted to this inventory. The gem is that you can search for a given route, and get technical details on the given route. IVS is called in German (Bundesinventar der historischen Verkehrswege der Schweiz), and it has become for IH an ultimate companion for very interesting trolls in the Swiss landscape. The quality of the inventory is, in our opinion, very high. 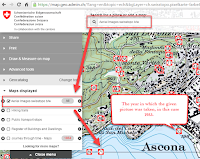 Every route (marked in red) becomes a very nice journey through times, with an excellent report, see here an example of Ascona (left picture).